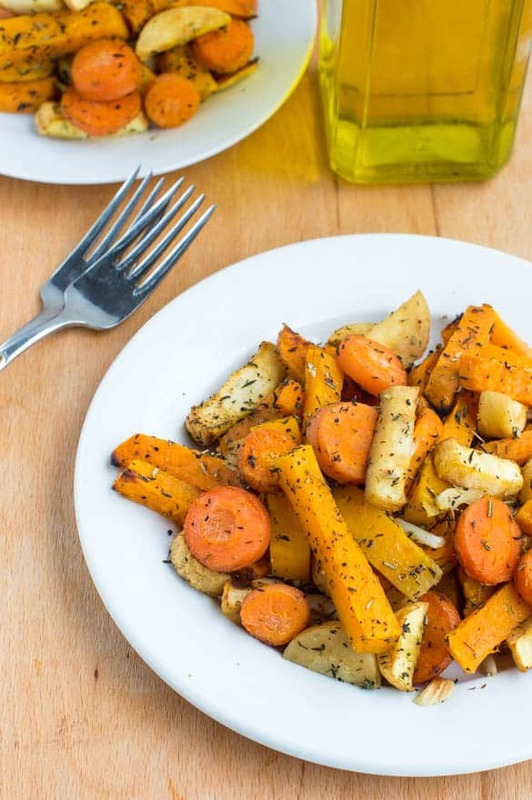 Roasted vegetable platter – A vegan roasted platter consisting of butternut squash, carrots, parsnips and sweet potatoes. I’m very excited to share with you this delicious roasted vegetable platter. 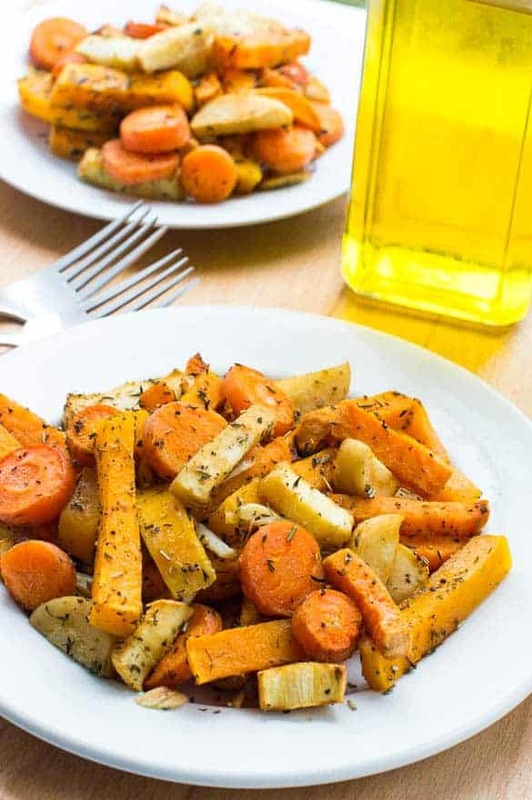 This is an assortment of healthy vegetables, lightly seasoned with herbs and olive oil. You don’t have to be a vegan/vegetarian to enjoy this dish (heck, I’m not). It’s so simple, healthy and not to mention equally as tasty too. Don’t be fooled by this meat free dish, irrespective of the omission of meat. All of the vegetables are nutritional dense with a moderate serving of starch and subtle sweetness. 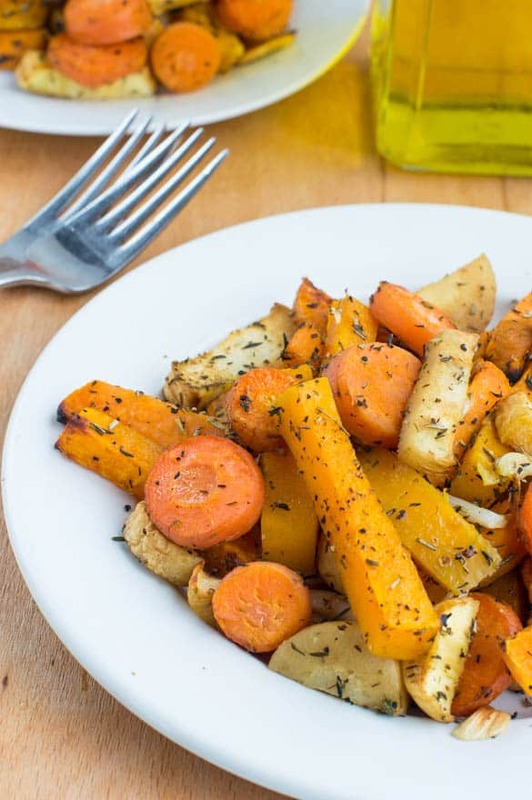 Many people avoid starchy vegetables because they are noted as high on the glycemic index (a number chart which rates how quickly carbohydrate is broken down into glucose – blood sugar). However, most of these vegetable contains a myriad of vitamins and minerals which are good for the body. 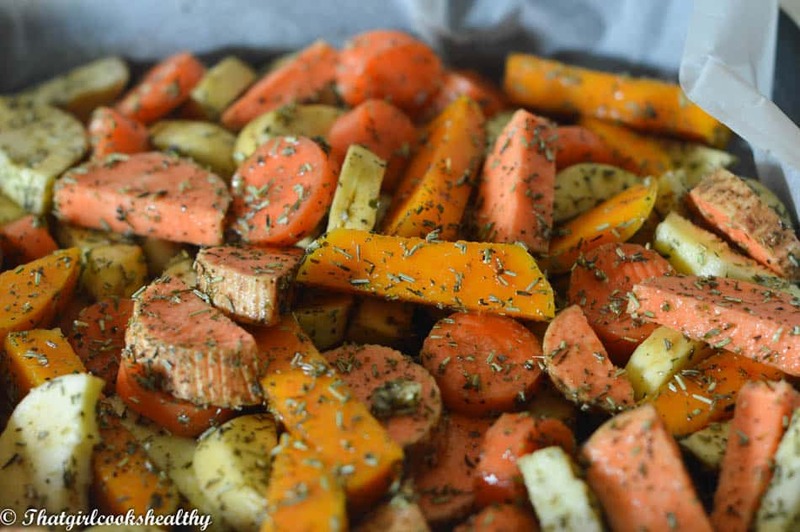 Can I add meat to my roasted vegetable platter? There’s no need to add any meat to this dish, although any addition is entirely your choice. Go on try, what are you waiting for? try this recipe I triple dare you! haha! 1. Preheat the oven on 220c (Gas mark 7). 2. Gather all the vegetables, evenly in a large roasting tin (I lined mine with parchment paper). 3. Carefully distribute the herbs, salt, pepper and garlic over the vegetables and then pour the olive oil. 4. Use your hands to massage the oily herbaceous mix into the vegetables, to ensure everything is evenly coated. 5. Set aside and allow to marinate for roughly 2 hours (so flavours fully permeate). 6. Place tray on the top rack of oven, cook for 50-60 until golden brown, turn the vegetable periodically through the cooking time. Preheat the oven on 220c (Gas mark 7). Gather all the vegetables, evenly in a large roasting tin (I lined mine with parchment paper). Carefully distribute the herbs, salt, pepper and garlic over the vegetables and then pour the olive oil. Use your hands to massage the oily herbaceous mix into the vegetables, to ensure everything is evenly coated. Set aside and allow to marinate for roughly 2 hours (so flavours fully permeate). Place tray on the top rack of oven, cook for 50-60 until golden brown, turn the vegetable periodically through the cooking time. 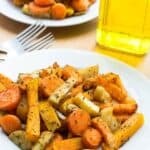 I love how this recipe incorporates some of my favorite veggies. For people who are following an oil- and salt-free diet, I would still recommend you try this dish. Simply omit the olive oil and pink salt. I might add nutritional yeast to the seasonings. Or if you’re not oil-free but just looking to cut calories, try a spritzer for the olive oil and use sparingly. That’s a great suggestion as the nutritional yeast would impart a more cheesy taste.